I've been asked several times about the SoS solo build, so I'll put a small tutorial up here as well as the build, and if you need additional help you can ask me ingame. Boon of Creation: Enchantment Spell. For 15...51...60 seconds, whenever you create a creature, you gain 5...41...50 Health and 1...5...6 Energy. This is for energy management. Maintain this. Pain: Binding Ritual. Create a level 1...10...12 spirit. This spirit's attacks deal 5...25...30 damage. This spirit dies after 30...126...150 seconds. A damaging spirit that pays for itself in energy cost with Boon of Creation. Bloodsong: Binding Ritual. Create a level 1...10...12 spirit who dies after 30...126...150 seconds. Attacks by that spirit steal up to 5...21...25 Health. A damaging spirit that pays for itself in energy cost with Boon of Creation. Shadowsong: Binding Ritual. Create a level 1...8...10 spirit. The spirit's attacks cause Blindness for 1...5...6 seconds. This spirit dies after 30 seconds. This spiritis very useful when attacking one target, because it will very rarely deal damage, as it is blinded. Signet of Spirits: Elite Signet. Create 3 level 1...10...12 spirits. These spirits deal 5...21...25 damage with attacks and die after 60 seconds. This summons three damaging spirits and also regains lost energy from Shadowsong. Armor of Unfeeling: Skill. For 10...30...35 seconds, your spirits within earshot take 50% less damage and are immune to critical attacks. This is mandatory in Hard Mode, but very helpful in Normal Mode. Maintain this. Painful Bond: Hex Spell. For 10...18...20 seconds, target foe and all nearby foes are hexed with Painful Bond and take 8...18...20 damage whenever hit by a spirit's attack. This spell just about doubles the damage you deal. Cast whenever you can. Summon Spirits: Spell. All spirits you control Shadow Step to your location, and gain 60...92...100 Health. This is helpful when moving to another target so you don't have to pull to the spirits or resummon them all. Use this whenever a spirit is low on health or you need to move them. It is a good thing to have max armor so you can survive if you take some of the aggro until you can summon your spirits around you and run. If you are good enough that you never take any of the aggro, a Superior Rune in Communing, Channeling Magic, and Spawning Power will help get the job done faster. As for weapons, just choose your mods, but don't attack. Your spirits are less likely to lose aggro if you don't attack, and it doesn't speed the process up much anyway. Once you get into the Underworld,back up into the souls so you don't aggro while you prepare. Cast Boon of Creation, then your spirits in order. Cast Armor of Unfeeling. Run just out of aggro range of the thing you are going to attack Summon Spirits. Cast Painful Bond on the closest foe. Back up slowly, healing with Summon Spirits and maintaining Armor of Unfeeling and Boon of Creation. If your spirits die, recreate them. Once you clear the starting zone, take the quest Clear the Chamber. Kill the Grasping Darknesses that spawn and go complete the quest. Take care when killing the Terrorweb Dryders, as they can be deadly to you. Take Restoring Grenth's Monuments. Run around the Underworld and kill things. For Globs of Ectoplasm, kill Bladed Aatxe, Grasping Darknesses, and Skeletons of Dhuum. This build doesn't work very well on Smite Crawlers, but if you choose to fight them, do not cast Painful Bond. They have Smite Hex. Enjoy your spoils. You can do it in Normal Mode or Hard Mode, but Hard Mode does not increase the Ecto drop rate. There are pop-ups that I can either show you or you can figure out on your own, including Dying Nightmares, which will remove your Boon of Creation enchantment if not killed quickly enough. Leave from Seitung Harbor. 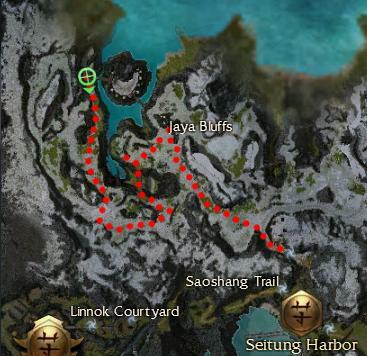 Follow this route, killing all Sensali in sight, the same way as in the Underworld Farm. Only pick up Feathers and Feathered Scalps in Normal Mode; the items aren't worth it. This farm yields about 125 Feathers in a 15 minute run. At 9k a stack, that's roughly 18k an hour. God this is all so confusing. Only part I understood was the "take this route and only grab these things." You won't understand what I typed for the feather farm unless you read the UW farm, because I described the order you use the skills in there. I run this build often (I swap Armor of Unfeeling for Flesh of my Flesh in teams) and I have farmed feathers exactly as you describe, but I never though of trying it out in UW on my own. Sounds like fun, I'll have to try it. I've always been at a lost to chose the "best" equipment, any tips? I just got new armor for my Rit and decided to put Shaman x5 on her since I play spirit builds most of the time, minor spawning and minor resto for general purpose, a Major Vigor and a Vitae for the rest. Weapon choice is where I usually have no clue if what I'm doing is right. Currently I mostly run a 16q10 tactics shield (so ends up as AR with a shield handle of devotion (+44, nobody's perfect) since I try to maintain Boon of Creation 100% of the time. It also has an empty inscription slot, but I have no real idea which one would be most helpful. Of course, maybe I should use my channeling focus instead. It has +12e (not really needed), +30 health (but unconditional) and +1 Channeling magic 20% to get "better" spirits? In the other hand, I have a green Kaolin Wand q9 spawning, +10 HSR + 10 HCT, mainly because I liked the look of it. what should I be looking for? + health? As I write this, I wonder is a 40/40 set (which I don't have) is what I need. After all I'm a spammer. I usually feel that spirit life vs recharge is acceptable, but since spamming spirits is also primary healing, the faster they recharge the better? HCT is nice too. For armor I would say your safest bet is Shaman's. Just in case. I'd say a Caster Spear would work out alright for your build. Also perhaps a Channeling +1 20% chance offhand. It just hit me! spirits not Spells, they are Binding Rituals. Dang, I get caught over and over with not paying attention to the "fine print" and making assumptions that aren't true. a 40/40 set is a complete waste on a spirit spammer. My Kaolin Wand might be pretty, but it's not very useful. I think I'll stick the shield for the +8 armor and conditional +health. I'll check what kind of inscriptions it might also benefit from. Ever since I got it, I've been using Ssyn's Staff. Req9 Channel, +60 hp, and some recharge stats. Works pretty nice for spirit spamming. It is a decent staff, but you can do better. Since it is Binding Rituals and not Spells, the 20 percent recharge is not so great. The only significantly useful mod for spirit spamming in my opinion is the +1 attribute mod. Other than that, you can pretty much just go with whatever you feel like having as mods. If you like HP, go for extra HP. If you like energy, go with energy mods. If you like something else, feel free to throw it in. The recharge/casting time mods aren't necessarily completely useless (the staff's 20% recharge bonus for all spells can benefit Summon Spirits in particular), but again it's more a matter of preference than an objectively significant benefit.